With so many sites battling it out on the World Wide Web, having a website for your small business is not enough any longer. In order to make an impact on your industry, you need to invest in a high-quality, custom website design. But it makes sense to understand how effective your website is and what changes you need to make in order to increase your website traffic. And measuring and analyzing your website traffic if your website is useful, attractive and effective is easier said than done. Fortunately, the Internet swarms with several useful web analytics tools that make it easy for you to understand how many visitors come to your site, where do they come from and how much time do they spend on your website. 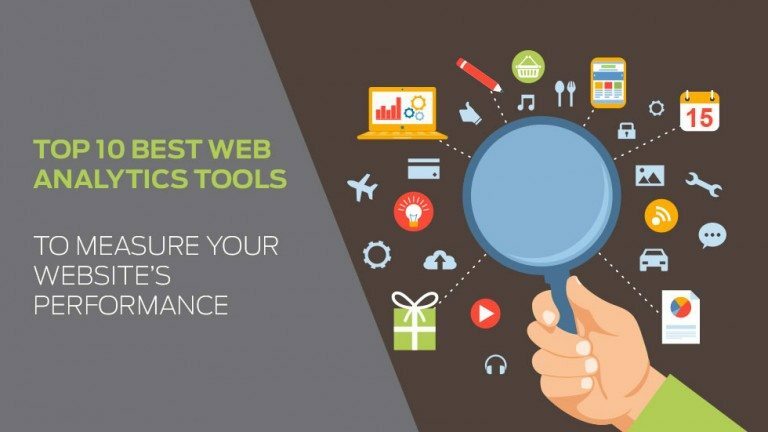 So, without further ado, let’s explore 10 such web analytics tools that you go a long way in providing you a detailed insight about your website traffic. Google Analytics: It is one of the best free web analytics tools that can help you track and analyze data about website traffic. It helps you understand what’s working well for your website and what’s turning your visitors off. This tool provides you with easy to understand reports for your website with detailed analytical reports on visitors, sources, goals, content and social media pages. Spring Metrics: Spring Metrics further simplifies the process of web traffic analysis. This tool helps you get dazzling insight on real-time conversion, your converting sources, converting keywords, landing-page analysis and e-mail performance insights. With 22+ behavioral triggers to pick and choose from, the possibilities are absolutely endless for those using Spring Metrics. Kissmetrics: Yet another much sought after analytics tool, Kissmetrics allows you to track your visitors and their movement on different pages of your small business website. This amazing tool delivers key insights and timely interactions to help you turn your visitors into customers. Mint: It is an another web analytics tools that offers real-time stats which isn’t available with free Google Analytics tool. Quite like Woopra, Mint allows you to track your visitors and see where they are coming from and what web pages are they visiting on your site. Mint’s flexible dashboard provides valuable insights on unique visits, referrers, popular pages and searches on your small business website. Clicky: If you’re looking for real-time web traffic analytics with spy view, Clicky is the tool for you. It allows you track your website visitors and get to see what they are doing on your small business website. But what makes it really special is the fact that it is available on mobile making it easy for you to analyze your website traffic on the go. Chartbeat: Chartbeat is another tool lets that allows you to keep a track of your visitors and what they are doing on your website. This amazing web analytics tool gives you all relevant information on your content. If it’s capturing and holding audience attention. In addition, it also helps you monetize the inventory on the pages with your highest quality content and audience engagement. UserTesting: UserTesting is yet another brilliant tool to understand and analyze behavior pattern of your target audiences. At UserTesting, you get access to videos of your target market using any site or app to help you understand what your website visitors like and what they don’t like. In addition, this tool offers you access to over one million users to help you understand your exact target audience and get valuable feedback within no time. Crazy Egg: Crazy Egg makes it easy for you to understand what’s making your visitors leave your small business website. In addition, this tool helps you understand how users click and scroll through your website. Gaurav Kumar has been a blogger, digital marketer and an SEO expert at Designhill.com, one of the fastest growing custom design crowdsourcing platforms. Over the years, he has been helping small businesses and startups improve website design and SEO strategy, content marketing and user experience.